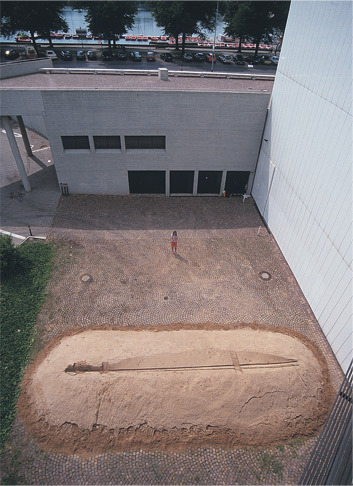 Impression of a 20 ton London tugboat's hull in clay and sand. 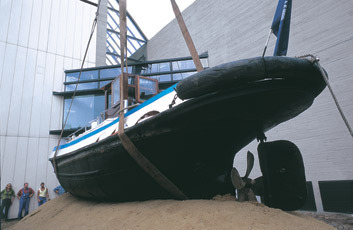 At the end of July, 1997, Max Couper’s tugboat was lifted out by harbour crane at Hanover’s Lindener Harbour and transported by road into the Sprengel Museum, where it was dropped from five metres into a mound of 100 tons of Hanover clay and sand. It was then removed to leave behind the imprint of its underbelly: the Tug Print. The tug then returned to London, whilst the Tug Print remained in situ, slowly cracking up. This was an artwork that had developed in three quite separate ways. 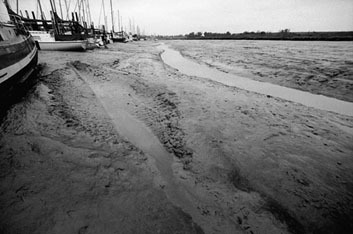 First an original accidental imprint had been made some years earlier in a muddy creek of the east coast of England. Then there was the spectacle and performance of making the print in the museum, broadcast on international television. And finally there was the aftermath, in which the print had become a silent part of the museum’s collection – begging the question of the visitor of what had made it – obvious only that it must have come from above.